I know you must be excited to take a bird's eye view of the emerald green water, the coconut fringed beaches and the islands from the sky and experience the thrill of parasailing in Langkawi. And when you see so many parachutes in the sky at a beach like Pantai Cenang, it's hard to resists the temptation of taking a flight. But before you start you parasailing adventure in Langkawi, I would like to make you aware of the risks associated with some unscrupulous operators who may lure you for a parasail at a cheap price. I don't want to sound negative here, but for your own safety, you must understand the legal norms in the island and should therefore choose the right licensed operator, even if you need to pay a little more. 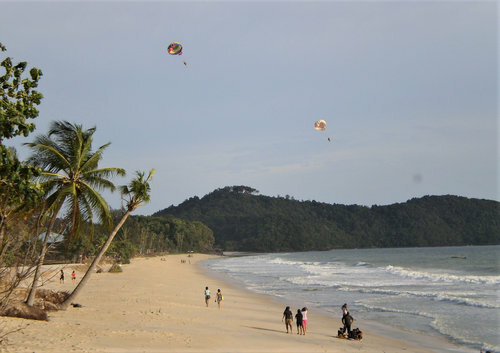 Parasail launching & landing directly at the beaches like Pantai Cenang & Tengah have been declared illegal by the town council. Why? Because there are tall coconut trees, overhead power lines, resort buildings and even barbed wires that fringe the beaches. There have been several cases where the parachutes have landed on the trees and buildings resulting in severe injuries. Despite such incidents, there are unlicensed local operators who continue to offer parasailing from the beaches. I have seen one having a tow line with a knot, and several others having boats unworthy of pulling the tow line properly to offer a stable flight. There has also been instances where the tow line got entangled with the mast of a passing yacht. In one case, I have seen the rider landing on the beach on his belly and getting dragged for several yards. Also note that while launching directly from the beach, as you are harnessed to the parachute, you will be pulled by the boat with a long towing rope. And you will then need to start running towards the water and synchronize your take off with the lift to make it a safe launch. I have seen several beginners who were unable to do that resulting in injury or discomfort. So how do you then parasail in Langkawi? The only safe & legal way is to go through a licensed operator who has a boat designed with all necessary equipment for parasiling fitted on board. They will take the boat off shore to a safe water area (about 10 minutes ride), then launch you from the boat itself. The parasail usually has a capacity of lifting two to three persons together so that you can enjoy the sky ride with your partner or family. The launching in this case is smooth. Depending on your height & weight, the operator will use the appropriate harness and life vest to ensure you are fully secured and safe. You don't get wet as you are lifted and then reach the sky about 500 feet above the sea level enjoying the stunning sights. You will see the boat looking like a tiny dot in the water. Having remained airborne for about 10 minutes, you will land back into the boat smoothly without even getting your feet wet. The boat will then get you back to the shore (another 10 minutes). So the entire parasailing adventure lasts for bout 30 minutes. This is the safest and the best way of parasailing in Langkawi. Such rides are presently available from Pantai Cenang beach, Tanjung Rhu beach and Kuah (bass harbor). The next question is who are the best & licensed parasail operators in Langkawi? While there are couple of licensed operators in Langkawi, there is presently only one operator called NAAM Sports who actually has a specially designed boat and offers parasail from Pantai Cenang, Kuah and Tanjung Rhu. Check out Top Langkawi WaterSports Operators and go to the appropriate section to know about their offerings and also get contact information for booking and further inquiry.